I’ll never forget the overwhelming heat on my face and shoulders, the crunch of red rock beneath my boots, or the burning sensation in my calves. 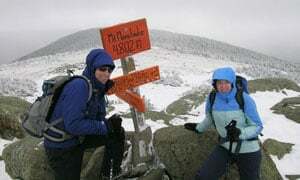 What a relief to hit the trail, what a drastic change from sitting in a cubicle all day! The switchbacks seemed endless, but it seemed that a breeze would spring up at just the right moment to keep us going. I held tightly, unnecessarily tightly, to the heavy chain bolted into the rock along the ridge. It was dizzying to look down the cliff face to the valley below, but the view was too beautiful to ignore. When we finally crested the top of the knife-edge trail, I realized we had made the right decision about how to spend our honeymoon. Angel’s Landing trail at Zion National Park is one of the most difficult and most rewarding hikes I’ve ever experienced, and it was just one of many adventures to come. After months of deliberation, mind-changing, and scanning discount airline websites for good deals, my fiancé and I finally decided to spend our honeymoon traveling through the national parks and monuments in Southern Utah. Despite having grown up just a few hours north of our destinations, I had never visited the spectacular scenery of the red rock deserts and the canyon country. Though I had always dreamed of an Italian tour, I realized that seeing the sights of Utah with my new husband would be a great chance to balance relaxation with the outdoor activities that we love. After the stresses of the wedding, we could hardly wait for our week and half of adventure, which we scheduled from September 3rd to 11th, 2007. We planned a multi-sport adventure including hiking, rock climbing, and boating, but we also wanted a touch of luxury and pampering during our trip. For this reason, we chose to stay at the historic lodges in the national parks. This included Zion Lodge, Bryce Canyon Lodge, and the North Rim Lodge at the Grand Canyon. These beautiful old buildings were all designed to blend in with the landscape around them, and they all offer fantastic views unique to each park. We had a delicious dessert of fudge lava cake at Zion's Red Rock Grille surrounded by the massive red cliffs. 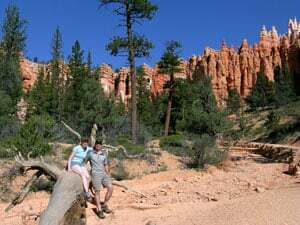 We feasted on pork chops and stuffed chicken breast at Bryce Canyon's dining room, followed by a sunset hike overlooking the whimsical hoodoos. We shared a chilled bottle of wine on the porch of the North Rim Lodge, which offers unbeatable views of the monumental Grand Canyon. We are so grateful to our wedding guests who contributed to our Traveler’s Joy registry and enabled us to stay at these unique lodges. My husband and I have always connected with each other through spending time in the outdoors, and we wanted our honeymoon to walk the line between energetic activities and relaxing moments. We researched and chose items for our registry keeping this in mind, and we were able to invent gifts for every budget and personality. 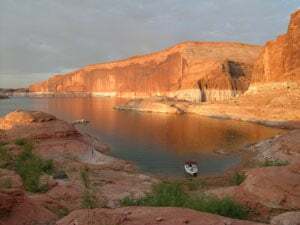 Our more adventurous guests gave us a guided day of rock climbing at Snow Canyon State Park in St. George, a scenic mule ride in the Grand Canyon, and a power boat rental to cruise the sparkling waters of Lake Powell. More traditional guests generously provided a post-hike couples massage at a spa in Zion, handcrafted Navajo pottery from a shop in Moab, and a gourmet picnic dinner and wine to share at Cedar Breaks National Monument. Guests on a budget were able to help out with a campfire dinner and s’mores, a hearty pancake breakfast, and a collection of National Park postcards. Many of our friends and family commented that our trip looked like it would be fantastic, and due to their generosity it will be a lasting, cherished memory. 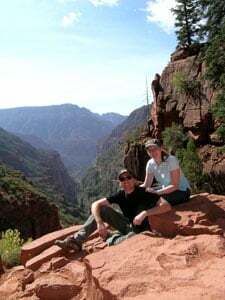 I would absolutely recommend our honeymoon trip through Southern Utah and the Grand Canyon to anyone wanting to share a romantic outdoor adventure. 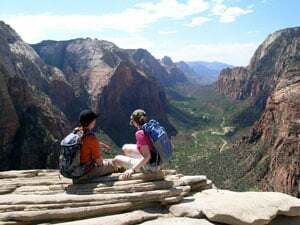 We highly suggest Utah as a destination for any athletically-inclined honeymooners, or anyone looking for a romantic way to experience the beauty of the National Parks. Including our airfare (which we did not include in the registry, since our wedding took place in Salt Lake City) the whole trip cost just under $3000. It was an unforgettable opportunity to see some of the most spectacular scenery in the U.S., and our Traveler’s Joy registry allowed our guests to become part of the experience. It was so popular that we received all but three of the items we requested, and we thanked those who contributed with photos of the trip enclosed in thank you cards. Now that we’re back to our 9 to 5 routine, back in the confines of cubicles, we wish we could do the honeymoon registry all over again! It was by far the most enjoyable part of our wedding planning, and we’ll treasure the memories we created forever.